Breakfast: The strawberries are super sweet right now. 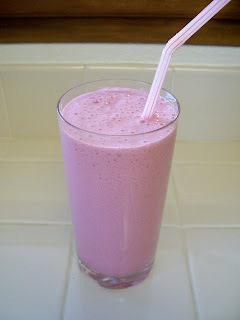 At the Farmer's Market last weekend I bought 1/4 of a flat and that same day I washed, trimmed and froze about 1/2 of them for smoothies like my Triple Strawberry Protein Smoothie. It's called triple strawberry because I use Sugar Free Strawberry Torani Syrup, a scoop of my Strawberry Max Protein, and the yummy frozen berries. Lunch: Tuesday I had made one of my favorite post-op dinners Crockpot Carnitas. 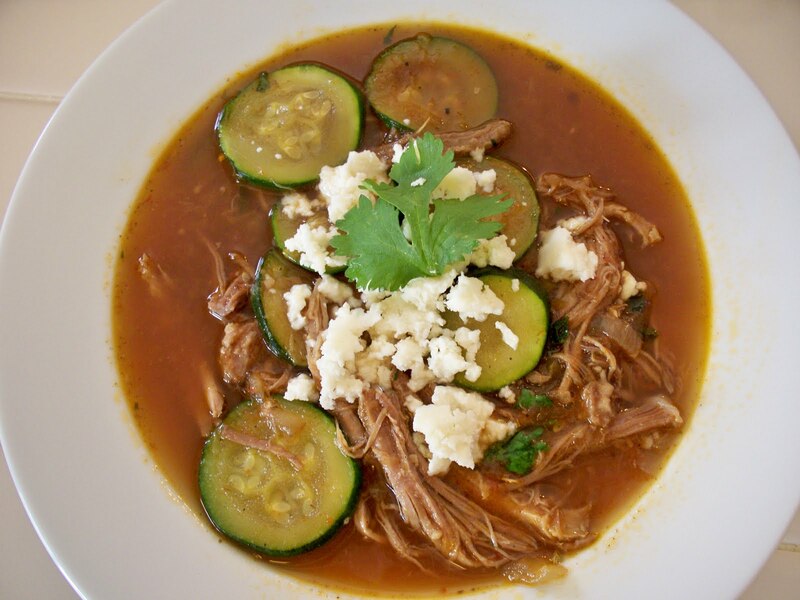 So for lunch I took the leftovers (about 3 cups of Carnitas), the leftover sauteed Zucchini (about 1 cup) we had as a side dish that night, dumped them in a pot with 1 (15 oz.) can of Chicken Broth, 1/2 teaspoon of Oregano, a Tablespoon of chopped fresh Cilantro, and a few twists of black pepper to make a quickie Carnitas Soup. You may have to adjust the broth amount depending on how much of each leftover you have. I topped each serving with fresh Mexican Cheese (Queso Fresco) It was delicioso. Dinner: I made my Crustless Chicken Pot Pie. Remember that casserole I screwed up when I was sick with the flu. I'm glad I did... I love it. Bake for 10 minutes exactly in a 375 oven on a lightly oiled cookie sheet till crispy and Mmmm. Oh FYI for fellow coffee addicts: If you bring a reusable mug to any Starbucks (today only) you can get free brewed coffee. I utilize the free wifi at my local Starbucks some days to do my computer work so I will be taking advantage. Honestly, you really should go to town with the pics. I was following a blogger for awhile who traveled a LOT and posting nothing but detail pics of all of his hotel rooms. It was suprisingly interesting! And you never know about those welcome packs. I received one (Hotel Diva, SF) which contained mini deodorant, razor, shampoo, soap, temp tattoos of the hotel's logo, and a sample of KY lube. Congratulations on winning the trip and makeover! It was fun to stop by, vote and watch you pull in front of the rest. You deserve it!